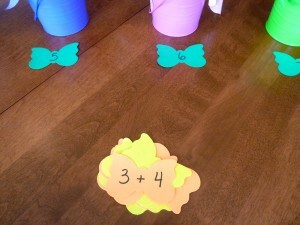 This is a station activity that I made last year to help Andrew work on his math facts. It was a huge hit with him and it is another example of how easy it is to tweak something so that a child can demonstrate their knowledge. Intelligibility and legibility DO NOT indicate intelligence! He was not able to write numbers at the time we did this so it gave him the opportunity to show what he knew without something like fine motor weakness or intelligible language standing in the way. If he was only allowed to show what he knew by filling out worksheets or using flashcards in the traditional way, it would have appeared as though he didn’t know the answer. I would have been expecting him to be able to show or tell me the answer in ways he was not able to. By making small modifications to something very basic, he was able to demonstrate to me that he understood what the equation was asking as well as showing he knew how to figure out the answer. 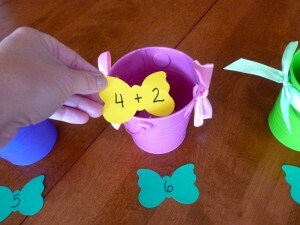 It was not something he had memorized at the time and it was fascinating to watch him figure out the answer and place the butterfly into the pail. 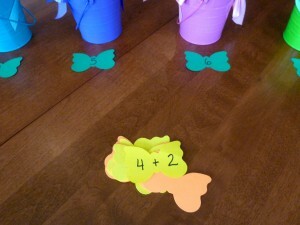 My Obstacle Course Station Activity: Sort the equations by their sum. 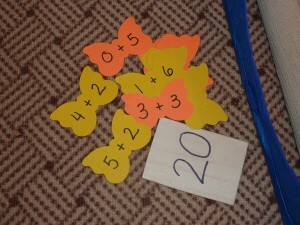 and wrote some math facts that were appropriate for what he was ready for and working on in school. 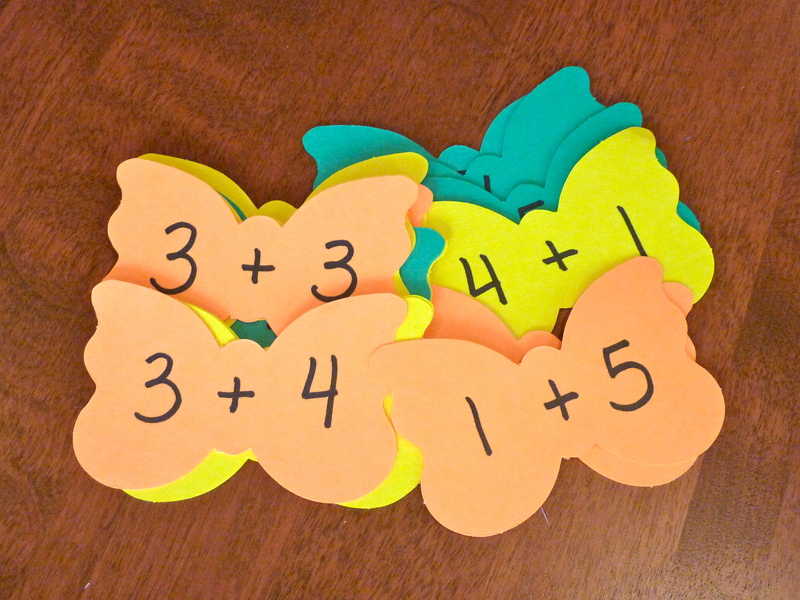 I chose to focus on four different sums (4, 5, 6 and 7) and picked 3 equations per sum to write on the cutouts. That’s all it takes and the station is ready! 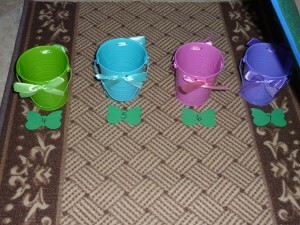 and placed it into the correct pail. 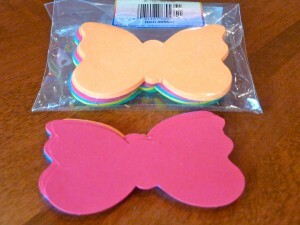 Repeat with the next cutout. 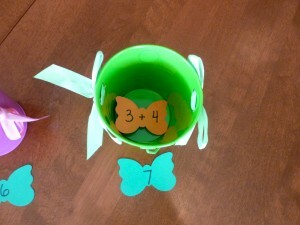 "3+4" gets placed into the "7" pail. 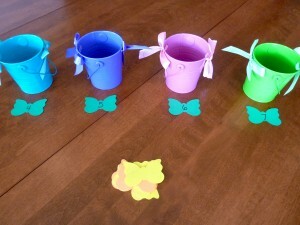 Continue until all of the cutouts have been placed into the correct pails. This is the actual station that he did last year and is the same as shown above with the addition of the carpet runner to incorporate crawling and movement. 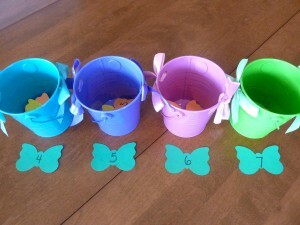 He started at one end, picked up one equation, crawled down to the other end of the runner and placed it into the correct pail. He crawled back and repeated this until all of the equations were sorted. It’s a total win-win because he thinks it is fun to be moving around while I know that he is working on things that are important for his brain development. Equations placed at one end of carpet runner for "Crawl and Sort."